Figure 15.9 The Batal Glacier in the Lahul Himalaya. A) View looking southwest at two large lateral moraines. B) Geomorphic map and profiles showing the main landform elements associated with this debris-covered glacier (Adapted after Benn & Owen, 2002). Where valley glaciers carry relatively small amounts of supraglacial debris, subglacial landsystems may be well exposed on the depositional surface (Figs. 15.4 and 15.14). Indeed, the beds of former valley glaciers may provide the best laboratories for studying the geomorphological and sedimentological products of subglacial processes, because landforms can be clearly placed within the spatial and temporal context of the glacier system as a whole, unlike areas of former ice sheet beds, where the wider context is often rather ill-defined (e.g. Hallet and Anderson, 1982; Sharp et al, 1989; Benn, 1994). 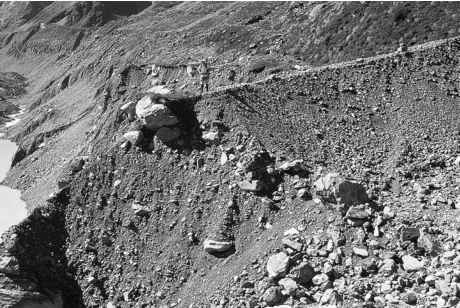 Figure 15.10 Breach-lobes of the Miage Glacier, Monte Bianco massif, Italy. A) Vertical aerial photograph of the debris-covered tongues of Miage Glacier. The breach-lobe moraines of the Amphitheatre date from > 1700 years BP. Other breaches have been exploited to form the three extant lobes of debris-covered ice. (Reproduced with permission of the Compagnia Generale Ripreseaeree, Parma, Italy.) B) Diagrammatic representation of the sequential development of phases of upbuilding and outbuilding of the breach-lobe moraines of Miage Amphitheatre (after Deline, 1999a). 1989). Down-glacier, more of the bed is occupied by subglacial till. The most abundant subglacial tills of mountain glaciers are overconsolidated lodgement- or high-strength deformation till, with matrix-support, a fissile structure, and abundant faceted, striated clasts (Benn, 1994; Benn and Evans, 1996). Fluted moraines commonly occur down-glacier of boulders and other obstructions (Boulton, 1976; Rose, 1989; Benn, 1994; Benn and Evans, 1996). The preservation potential of fluted moraines is low, and they may not survive as prominent landforms for more than a few decades. In older deglaciated terrain, fluted moraines and other subglacial till surfaces may be reduced to scattered flow-parallel stoss-and-lee boulders (Rose, 1992). Where glaciers extended from the confines of valleys onto fringing lowlands, the depositional zone can resemble the soft-bed subglacial landsystem described in Chapter 2 with drumlinized surfaces underlain by deformation tills and glacitectonites (Rose, 1987; Benn and Evans, 1996). This type of landsystem occurs at the margins of the Scottish Highlands, where piedmont glaciers flowed into lowlands underlain by glacimarine and glacilacustrine sediments during the Loch Lomond (Younger Dryas) Stade (Thorp, 1991; Benn and Evans, 1996). 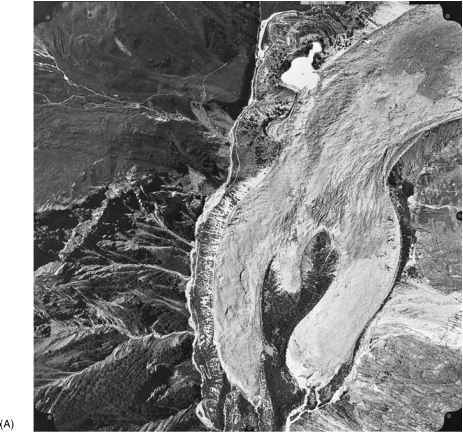 Figure 15.11 Oblique aerial photograph of the eastern margin of Tasman Glacier, New Zealand, where ice has expanded to form a lateral embayment in the mouth of Murchison Valley. Ice flow from top right. 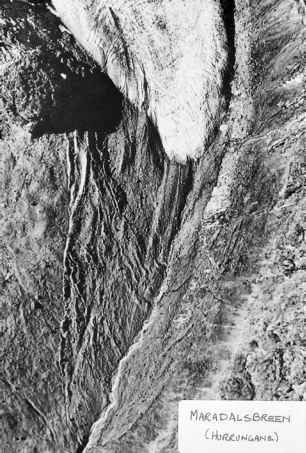 Figure 15.12 Boulder/ supraglacial melt-out till overlying basal melt-out till, forming a couplet deposited since the mid-1960s by stagnating ice in the Murchison embayment (Tasman Glacier, New Zealand). (Figure shown (arrow) for scale). Recessional moraines mark the positions of annual (winter) readvances or more significant longer-term advances of the margin, and are common in low-relief mountains. Moraines on the forelands of climatically sensitive clean glaciers can form a detailed archive of glacier oscillations and decadal climate change (Nesje and Dahl, 2000). 3. non-aligned mounds and ridges recording uncontrolled ice-marginal deposition (Benn, 1992; Bennett, 1994; Wilson and Evans, 2000; Fig. 15.15). 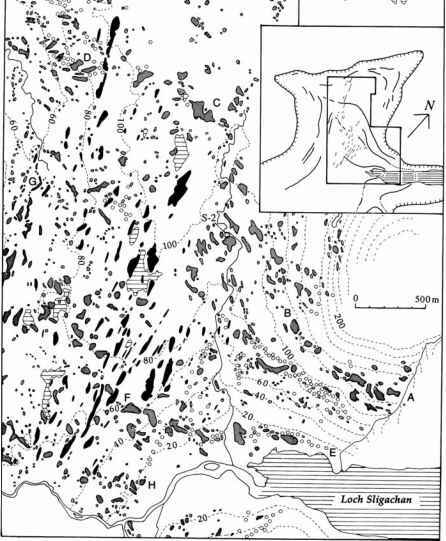 Figure 15.14 Recessional moraines superimposed on fluted moraines, Maradalsbreen, Norway. and Boulton, 1993; Bennett, 1994). Moraine morphology and sedimentology indicate that most are dump and push moraines, with varying amounts of proglacial tectonics. Bennett et al. (1998) argue that transverse elements within Scottish hummocky moraine result from proglacial and englacial thrusting, similar to the contemporary margins of polythermal Arctic glaciers. 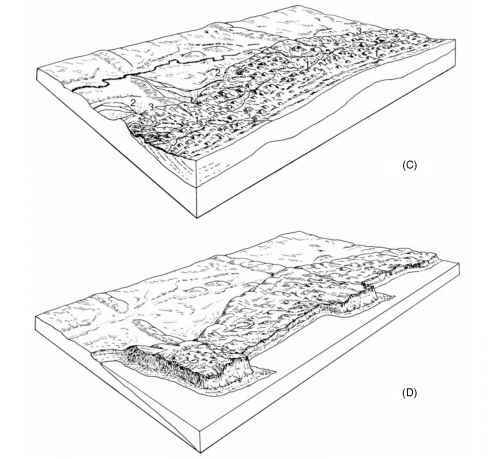 Aspects of this model are appealing, as it explains anomalously large amounts of debris within hummocky moraine in terms of glacial tectonics in a permafrost environment (Graham and Midgely, 2000). However, an alternative depositional model invoking multiple episodes of moraine deposition and reworking appears more plausible (Wilson and Evans, 2000). Ballantyne (2002b, Chapter 17) argues that inheritance of large volumes of glacial and paraglacial sediment is a characteristic of periods of renewed glaciation in mountain environments. Figure 15.15 Map of hummocky moraine, Sligachan, Isle of Skye. 1 = drumlins, 2 = moraine mounds and ridges. 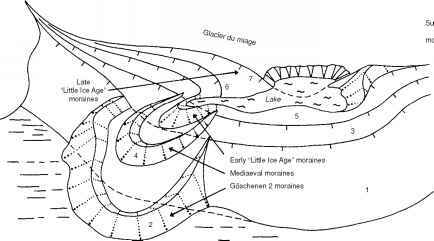 Note transverse chains of moraines marking ice-margin positions (e.g. A-D, E-F), a chain of eskers (G), and chaotic hummocky moraine (H); 3 = boulders, 4 = water bodies. Inset: Younger Dryas limits and main recessional moraines around Sligachan. (From Benn, 1992). foreland relief is low, the deposits of retreating glaciers in high-relief environments show close similarities to those of debris-rich temperate lowland ice lobes (e.g. Krüger, 1994a). Three facies of deposition have been defined by Eyles (1979) based upon associations between activity of the terminus, thickness of supraglacial cover and reworking by meltwater. 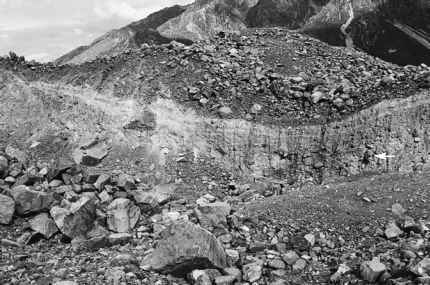 Facies 1 consists of thick reworked accumulations of supraglacial till deposited by backwasting and decay of melting ice cores buried beneath thick debris cover. Where ice at the terminus is stationary (or nearly so), a predominance of melt-out processes results in a chaotic distintegration topography which Eyles termed 'uncontrolled', because the final product does not reflect the geometry of the ice margin or structures within the ice. Facies 2 is laid down as a dispersed bouldery veneer by dumping from a retreating terminus, which can display down-glacier lineated patterns, reflecting deposition focused by structures such as gullies in the ice front. Debris cover is thin, and no relief inversions are associated with Facies 2 deposition. Seasonal dump moraines may contain internal bedding due to gravity-sorting after release of the debris from the ice margin. Facies 3 describes a supraglacial morainic till complex comprising interfingering lensate horizons of supraglacial melt-out till and glacifluvial sediment. The areal extent of facies 3-type successions is greater at inactive, low-gradient termini where meltwater streams and ponds occur within ice-cored terrain. The distribution and relative development of these facies may aid in the reconstruction of ice-margin dynamics during glacier retreat. 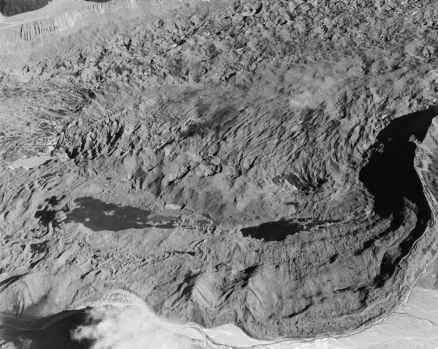 The evolution of downwasting, debris-covered glacier termini in Iceland has been documented by Krüger (1994a). His model emphasizes the importance of debris bands within the ice in supplying sediment to the ablating ice surface, and of the interaction between various gravitational, glacifluvial and glacilacustrine reworking processes. The final depositional assemblage consists of low-relief, hummocky topography underlain by variably deformed diamicts and sorted sediments. Supraglacial debris on many valley glaciers is delivered to the terminus as medial moraines. Though conspicuous features on many valley glaciers, they are seldom preserved as prominent landforms following deglaciation. This is because medial moraines generally contain relatively small amounts of debris and tend to undergo considerable reworking during glacier ablation. Where medial moraines consist of distinctive lithologies they may be clearly preserved, particularly where they consist of unusually large boulders. Deposition of medial moraines may form longitudinal bands of facies 1 or 2, superimposed on the underlying lodgement till plain (Eyles 1979; Fig. 15.16). How cross profiles of glacial moraines show variation? What does the climate have to be like for moraines to occur?